Both buildings Sakura and Ume of Rakutoko, Karakami is used for paper sliding doors in the bedroom. It is very beautiful in those decorated with plum and cherry pattern suit to each building name respectively. Kyo-Karakami is now still made with the traditional method which was introduced by China during Nara period. Because it’s expensive and very delicate, you rarely see it in hotels, yet we use it in our Machiya for the guests to experience Kyoto culture that takes something beautiful in the living space. Here’s the link of the information by the manufacturer Maruni.If you are interested, please take a look. 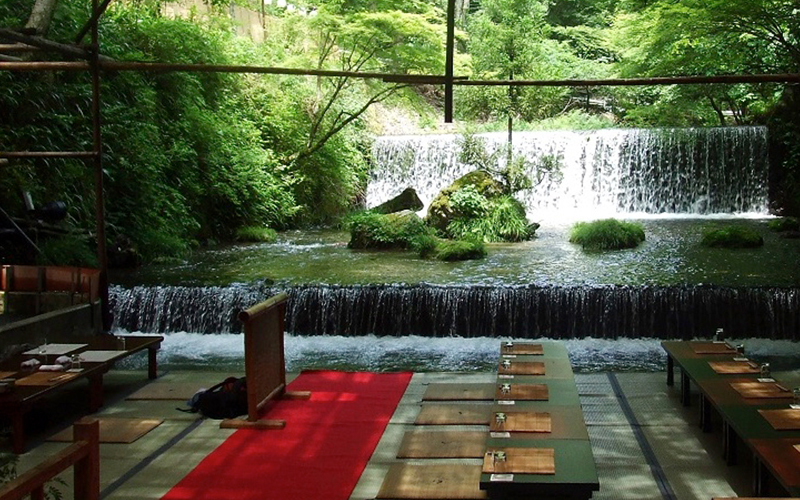 In Kyoto there is a custom to eat in the vicinity of the river only during the summer. This tradition started setting up a balcony by Kamogawa river and entertained guests. And “Kawadoko or Riverbed” was the feast which taken place on the parlor constructed on just above the Kifunegawa of Kyoto. Both ways are the cool way to enjoy Kyoto Summer.